Yannick behind a microscope looking at pollen tubes. 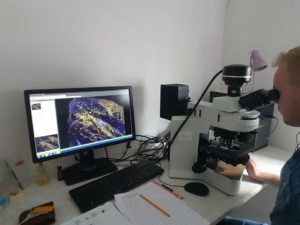 Recently, Yannick has spent a few days at the Botanical Institute of the Czech Academy of Science in Třeboň. There, together with Štěpán Janeček, he focused on pollen tubes of Hypoxis camerooniana, a common plant of montane grasslands of Mt. Cameroon. We selected this species as a model for our case study of the role of UV reflectance in pollination. The collected stigmas of specimens with manipulated UV patterns and control treatments were searched for germinating pollen grains to reveal whether they were effectively pollinated. Together with data on flower visitors, the pollen tubes will be analysed by Raissa, Štěpán’s Cameroonian PhD student.